Talking about security is a fad and I don’t like those fellows who hyped it.A system is as secure as one made it.It require constant vigilance to maintain that level.In this article I am going to share my own experience with GnuPG in very precise and compact manner. I will not be able to reveal all the information about it, as you can understand it is not desirable regarding this matter. What is GnuPG?? In one term it is a GNU version of OpenPGP written by Phil Zimmerman way back in 1991.You might have encounter it everyday if you are working with some corporate.Because the device (laptops specifically) they provide to work are PGP encrypted.And every time you need to work on those device you got to enter the passphrase to unlock it,because data is valuable to business corporates.Now if you are not statisfied the information I gave just now then you might look in here for more details information. I shall show you the impelementation of GnuPG on Gentoo,but it can be used on any distribution.If the native os repositories doesn’t have it,then get the tarball and install it as you do for many software. See I have it already ..so what’s the point to get once more.I choose N or no to this prompt.If you don’t have you might say yes. merge time: 1 minute and 57 seconds. merge time: 7 minutes and 14 seconds. merge time: 2 minutes and 12 seconds. So many entries because of updates.Now move on. Lets find files deflated into the system because of this software installation. We need to generate the keys to operate on..so create it.. The above command will generate the keys and it will ask you for the passphrase ,which will be glue with it.A new key-pair is created (key pair: secret and public key). The first question is which algorithm can be used. The next question is key length. This is something that is very user dependent. You need to choose between security and calculating time. If a key is longer the risk for cracking the message when intercepted decreases. But with a larger key calculation time also increases. If computing time is an issue you still should consider that you want to use the key for sometime. We all know that arithmetic performance increases very quickly, since new processors are getting quicker and quicker. So keep this in mind. The minimal key length GnuPG demands is 768 bits. However some people say you should have at a key-size of 2048 bits (which is also really a maximum with GnuPG at this moment). For DSA 1024 is a standard size. When security is a top priority and performance is less an issue you ought to pick the largest key-size available. The system now asks to enter names, comment and e-mail address. Based upon the entries here the code is calculated. You can change these settings later. During the period of generation of keys you should some disk activity or keep the system busy with some activity to generate more randomness in the key.But you SHOULD NOT FORGET YOUR KEYS,if you do all will be meaningless. 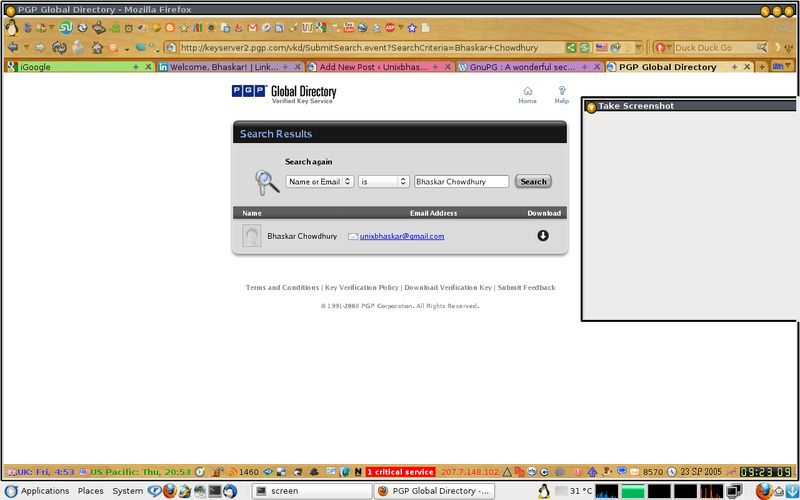 So you can see where it resides too..I mean which directory it store the public key. Right. Now if you click on the download button you can get my public id.So If I encrypt something with my private id and you have my public id you can view it. If you don’t mention the file name then it will take from the stdin. For several reasons you may want to revoke an existing key. For instance: the secret key has been stolen or became available to the wrong people, the UID has been changed, the key is not large enough anymore, etc. This has one disadvantage. If I do not know the passphrase the key has become useless. But I cannot revoke the key! To overcome this problem it is wise to create a revoke license when you create a key pair. And if you do so, keep it safe! This can be on disk, paper, etc. Make sure that this certificate will not fall into wrong hands!!!! If you don’t someone else can issue the revoke certificate for your key and make it useless. This is the authenticity of public keys. If you have a wrong public key you can say bye bye to the value of your encryption. To overcome such risks there is a possibility of signing keys. In that case you place your signature over the key, so that you are absolutely positive that this key is valid. This leads to the situation where the signature acknowledges that the user ID mentioned in the key is actually the owner of that key. With that reassurance you can start encrypting. Using the gpg –edit-key UID command for the key that needs to be signed you can sign it with the sign command. You should only sign a key as being authentic when you are ABSOLUTELY SURE that the key is really authentic !!!. So if you are positive you got the key yourself (like on a key signing party) or you got the key through other means and checked it (for instance by phone) using the fingerprint-mechanism. You should never sign a key based on any assumption. 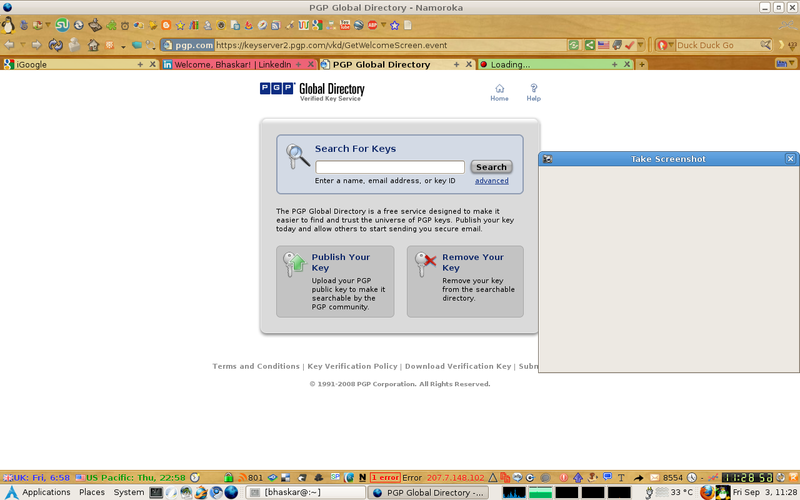 It will ask me to enter my passphrase to decrypt it..so I did and file content is displayed!!! Cool right!! merge time: 12 minutes and 16 seconds. merge time: 3 minutes and 53 seconds. merge time: 18 minutes and 41 seconds. merge time: 6 minutes and 31 seconds. Once that is installed and the key in place it just a matter of selection in the thunderbird security tab of account setting. GnuPG come with hell lot of options,yes quite intimidating one for the man page.But please glean over the man page of it to learn more. In this article I have asuumed many thing about the reader that,they are well versed with the encryption technique or rather know how they work. Whatever the distro the basic underlying fact is the same.So embrace yourself with the knowledge that matters.